Your school instruments will typically need some maintenance and service each year, and will sometimes need emergency repairs. 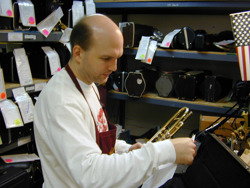 Most directors send their school instruments to the shop for regular maintenance and repair as soon as the band's schedule allows, usually at the beginning of the summer or at the end of marching season. This way they avoid the inevitable fall rush in band repair shops, and they can be sure their instruments will be ready for the next season. 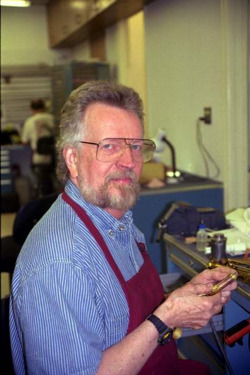 Except during the few weeks at the beginning of the school year, the Amro repair shop can usually do minor repairs in less than 24 hours, and more involved repairs within a few days. The Amro shop stocks one of the largest inventories of parts in the South so parts delays are minimized. If you have a repair that you need quickly, please let the technicians know and they can usually accommodate it. Sometimes they'll be able to do it while you wait. If you don't see the technicians often enough for them to know you, be sure to introduce yourself and let them know you're a band director. Band directors are VIPs at Amro. When you send an instrument to the shop for repairs, give the technicians an idea of how much work you'd like done. Some directors like to have everything done including preventative maintenance; others like only the minimum work done to get the instrument playing again. The technicians are willing to do whatever work you'd like and will understand budget constraints and special circumstances. Often, though, they have too little information and instructions on the repair tag and have to guess at how much the director would like done. If they do less, the director will be disappointed that the instrument wasn't fixed completely; if they do more, the director will be disappointed that the charges were more than expected. Useful instructions include "maximum playing condition", "playing condition", or "minimum playing condition." The in-store reps can email you estimates and you may email or call in your approval or questions. 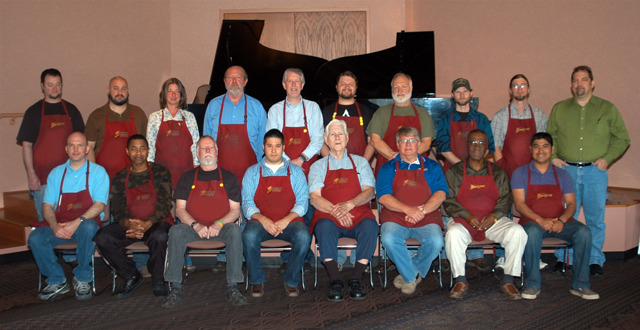 After your instruments are repaired, each will be played and checked by two technicians who will sign the repair ticket to make sure that nothing is overlooked and that the instrument plays properly when it leaves. Occasionally an instrument will get bumped in shipment or transport, and will be out of adjustment when it gets to you. If you encounter this, please call it to our attention; we'll take care of it quickly and at no charge. If you receive a repair that has obviously been damaged in shipment, please keep the shipping carton and call us right away. We'll notify the shipping company; they'll come make an inspection and report, and then return the instrument to us for repair. If we don't call them right away or we don't have the carton, they will often deny the damage claim. Information on repairs of student's instruments can be found here.